Christmas cookies, cooking, food, Magic Cookie Bars, Recipes, Whatever Happened to Dinner? 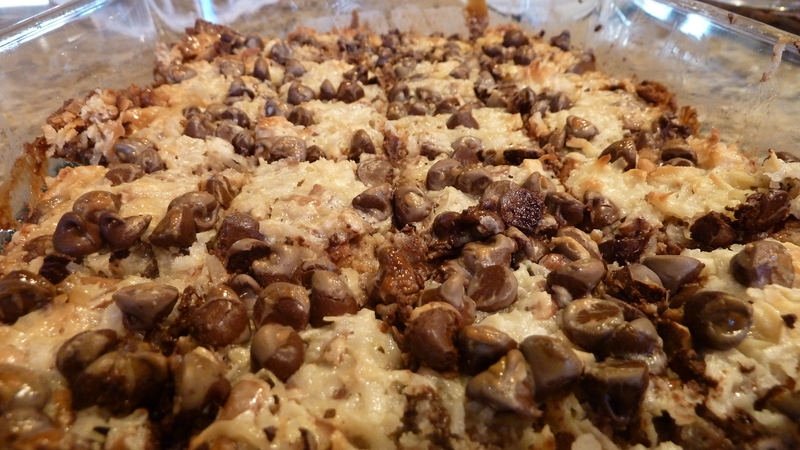 I like these cookie bars because you only dirty one pan making them and that is the pan you bake them in. 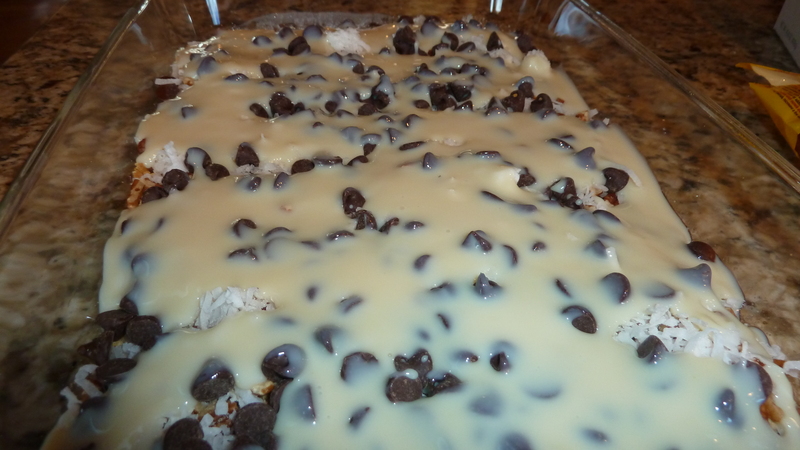 My husband loves these cookie bars because they are, when made right, just scrumptiously delicious and satisfying. But if you need a quick one dish wonder to take to small group, a potluck, or if company is coming over and you have these supplies in your pantry, go at it: graham crackers, chocolate chips, nuts, coconut, butter and sweetened condensed milk. You probably already have a recipe like this, I found it once on a can of sweetened condensed milk (SCM) although my smudgy card says I got it from Good Housekeeping and Home Ec. class, which I’ve adapted over the years. I thought it was a never-fail recipe until this last Christmas. I opened a can of the above named milk which had been in my pantry all year and it looked funny. Not creamy, it was more the color of caramel. I didn’t think it had actually spoiled, and it had not, just changed consistency. But I was desperate and already had all the other ingredients in the pan so I thought I would see if it would work. Baked at 350 degrees, even if it had spoiled, it wouldn’t kill anybody. Right? Meanwhile, I had bought a fresh can of SCM in early December, thinking I would make another batch if those didn’t go over so well. But my husband ate them without complaining even though they were less than stellar. I didn’t have the nerve to take them to a party. So this week (learning from my mistake that SCM eventually changes its consistency) I made another batch for some impromptu Monday night company. Still warmish from the oven, they were so rich and satisfying you could eat just one and be happy. 1 15 oz can sweetened condensed milk. Melt butter in a 9 x 12 “ cake pan in a 350 degree oven, watching carefully so it doesn’t brown. Meanwhile, crush about ¾ of one package of graham crackers in an old bread bag with a rolling pin until you have 1 ½ cups of crumbs; spread this into the melted butter in the pan, smoothing out to make a nice crumb crust. Sprinkle nuts over crumb/butter mixture, then chocolate chips, then coconut, and top by drizzling the sweetened condensed milk over it (honestly this is the hardest part, pour slowly, and spread lightly with spatula or knife if necessary. It also melts and spreads on its own in the oven). Bake for 25 minutes. Cool for 15 minutes, then cut into bars. Be sure to cut and remove within15 minutes or they stick badly to pan. Do you make these? What are your variations? What is your favorite one-dirty-dish creation? Thanks for the share! Yes, they are sweet and rich. Hmmm, does your recipe tell you to pour the sweetened condensed milk on last? I have never made it that way. I have one of those “name brand” cookbooks with all the original recipes off of boxes and cans. 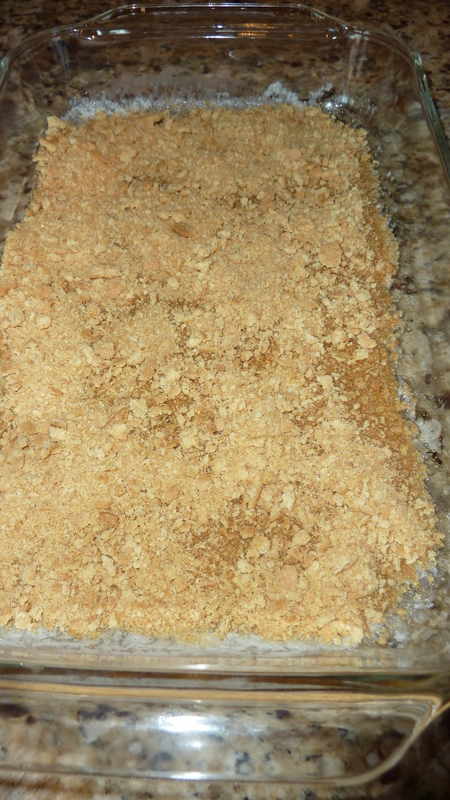 The SCM is the 3rd ingredient, poured over the crumbs. I also add the optional 1/3 cup butterscotch chips, along with the chocolate chips. We like it better using semi-sweet or bitter-sweet chips considering the amount of sweetness already in the recipe. Also spray your can with a non stick coating and they will not stick. We cool completely before cutting and removing. Except for the “samples” I find cut out from folks checking to see if they ” “are OK”. Yes, my recipe does have you pour on the sweet stuff very last. It probably doesn’t matter much in the end. I did forget to mention that I use the semi-sweet chips–a very important addition. Thanks! And I will try spraying the sides of the pan with non stick spray–I usually think, well, the bottom is all greasy anyway from the melted butter, but the stuff on the side sticks. I have the same recipe that you have except you also add butterscotch chips before chocolate chips, but you still pour the condensed milk on last. I do use semi-sweet chips like Athanasia. You should try with the butterscotch chips they are even more yummy! Sue, I think I’ve used the butterscotch a time or two, and then end up with most of the bag unused and nothing really to put them in. I’ll send them your way. Ha. 🙂 Thanks for chiming in. Stay warm. Oatmeal Scotchies are a good recipe for using butterscotch chips. I make it the original recipe with orange extract; now the recipe says vanilla. Athanasia, is there a recipe for Oatmeal Scotchies online? Vanilla extract sounds much better to me for such a recipe! Melodie, I think you can get the recipe on line, but like I said sometime between the 70’s and the 90’s they switched from orange extract to vanilla. I have the original recipe cut out and taped to a recipe card. It gives directions but it also says add 12oz pkg of chips to you favorite oatmeal cookie recipe. It’s pretty equivalent to the Quaker Oats recipe. BTW ,no raisins . Also I love it with the Orange extract!